It's about time we stopped yanking these simply yellow flowers out of are gardens and disposing of them. This week I found they have so much more to offer than fodder for the compost heap. Dandelions are making a come back. Not that they ever went away. These fabulous "weeds" flower nearly 10 months of the year and require no cultivation assistance from us gardeners. Restaurant's up and down the country are starting to use the flowers, leaves and roots in their recipes. If (like me) you aren't quite brave enough to use your dandelions for food, then taking advantage of its know medicinal benefits could be the way to go. This so called lawn pest, is actually packed full of vitamins and minerals. Its been documented as a cure of joint pain and warts since the 10th century. Making it idea for turning into a balm for gardeners. 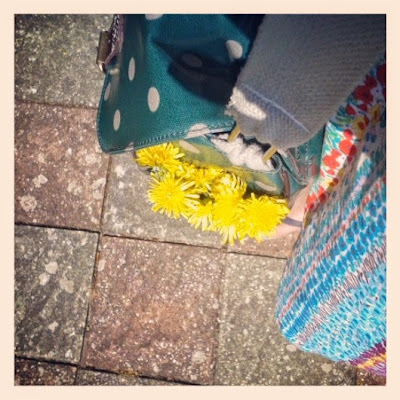 After harvesting the dandelions and leave in the sun for a few hours to allow them to dry out. 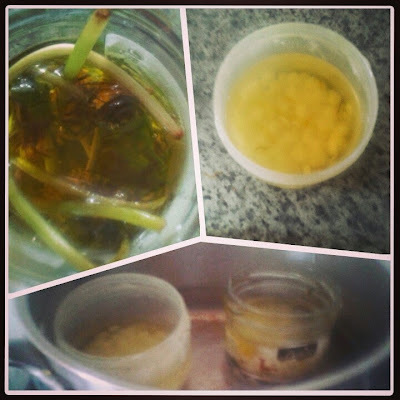 When infused remove the stalks then add beeswax pastilles-rule of thumb is to add 10-15% beeswax to volume of oil. If your jar capacity is 100ml then add two table spoons of pastilles. Pop the jar in a pan of boiling water the heat until the pastilles have dissolved. Stir thoroughly, remove from the hob and allow to cool. The result is a pretty firm balm, not too fragrant and great on dry skin. It's perhaps a little too effective as my husband has liberated for his own use. Apparently it works better than any dry skin moisturiser he's tried.